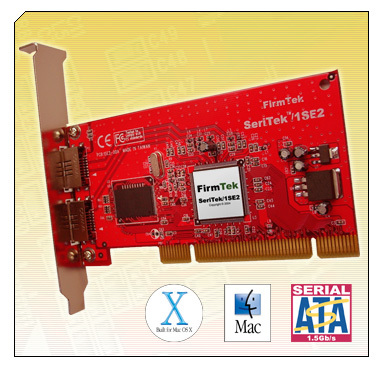 The SeriTek/1eSE2 extends Serial ATA's 1.5Gbits/sec performance to the outside of the Macintosh computer chassis, enabling users to take advantage of external Serial ATA enclosures. With two external ports, it provides the high bandwidth necessary to meet the needs of performance-hungry applications while offering hot-swap flexibility similar to that of Universal Serial Bus (USB) and FireWire. Using a unique patent-pending method, SeriTek/1eSE2 can even hot-swap RAID disks under both Mac OS 9 and OS X.